Country | Georgia Sea | Гостиницы, гостевые дома, рестораны, кафе, бары на черноморском побережье Грузии. The capital of Georgia – town Tbilisi is one of the most ancient cities of the world. It is 1500 years old. Until 1936 the city was called Tiflis in Russian transcription. It was called so due to warm sulfuric wells (translated from Georgian «tbili» means "warm"). The city is filled by unique national flavor. Almost all buildings in historical city centre and at the bottom of mountain Mtatsminda represent historical or cultural monuments. Georgian Orthodox church, the Armenian Apostolic church, the Synagogue and the Muslim mosque are located in the very centre of old Tbilisi. "Narikala" Fortress with a beautiful temple in its yard. Memorable photos could be taken from the top of towers. The modern bridge, named "WORLD BRIDGE" by the country president, which is the second in the world by the complexity of its architecture. "Sioni" Temple, located on the left coast of the bridge and well-known by its wonder-making icons. Sion Cathedral – is the current residence of the Catholicos of Georgia. Mountain "Mtatsminda" with famous wonderful garden "Funiculer" (mountain lift), from which one can clearly view all Tbilisi. Тhe Pantheon where many famous writers, actors, scientists, and national heroes of Georgia are buried. Well known sulfuric baths in the place called "Abanotubani"
Gudauri is a popular resort for skiing located 120 km far from Tbilisi, in Kazbeg area of Georgia, at the height of 2196 m. The resort is developing rapidly - more and more tourists visit the resort every year. The mountain-skiing season in Gudauri lasts from December till April. During that period comfortable driving is possible on all lines. Driving on the third line is possible from November till May. Throughout all season interested people can take advantage of unique possibility to test themselves in Heli Ski. But the most attracting thing in Gudauri is the free ride —descent through virgin fields. The deep blanket of snow, absence of stones and avalanche danger make Gudari very suitable for free ride. The length of the longest line is 7 km, difference of heights is ~1000 m.
Rope-ways work from 10:00 till 16:00 and are closed only in case of bad weather conditions – for very low visibility or strong wind. Gudauri is crowded especially during weekends, when local residents come here to spend their day-offs. Gori is located at the merge of Kur and Liakkhi rivers in a picturesque Kartli valley and is known from VI century. It is famous with its house-museums of S. Kamo and I. Stalin (local residents still revere his memory), ruins of a medieval Goristsihe fortress (VI century), as well as Goridjvari balneotherapeutic health resort. Stalin's huge bronze statue, one of а few remained in the world, stands in front of the graceful administration building on the main square of the city. Stalin's portrait and stone bust also decorate the building of railway station. 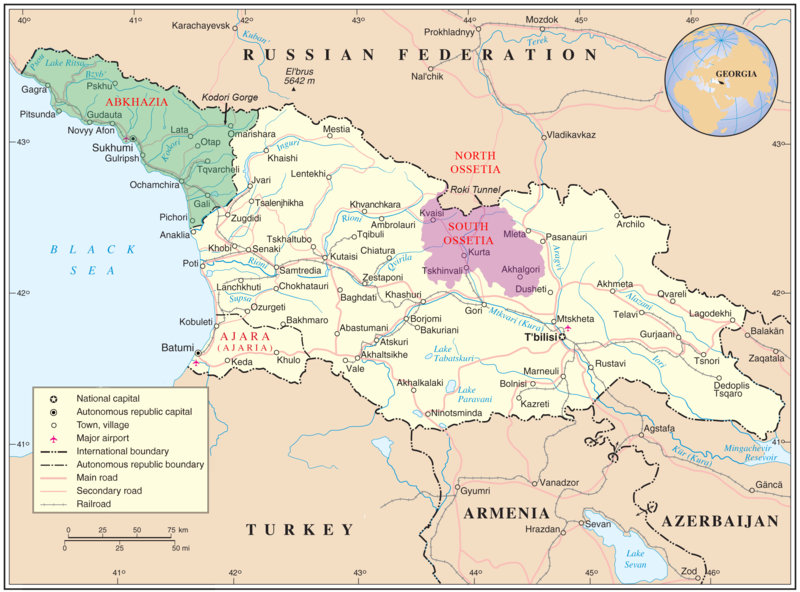 The republic Abkhazia (local name - "Apsni",) is located along the Black Sea coast in the north-west of Georgia. It is one of the warmest and cleanest areas of the coast. Here are such well-known earlier resorts, as Gagra, Ochamchira, Pitsunda, Sukhumi - one of the oldest cities of the coast with its well-known Botanical gardens, Noviy Afonis famous with its well-known caves, ruins of an ancient fortress and an antique temple, as well as its well-known monastery. The well-known natural monuments of region are lakes Ritz, Paleostomi, Aletkel and a huge cave complex located near Noviy Afon.